Need a creative solution for childcare on school holidays? 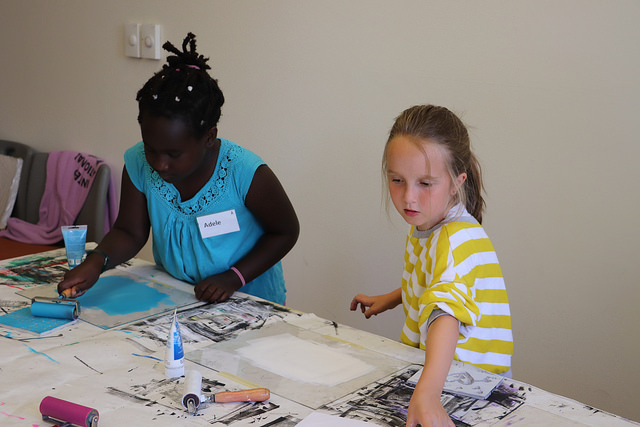 Mini Edition Arts Camp is just the thing! This fun and messy one-day camp, put on by the Shoreline-Lake Forest Park Arts Council is a perfect, creative solution! Campers will learn about modern African American masters, such as Romare Bearden, Augusta Savage, Jacob Lawrence, and Faith Ringgold, and create portraits and cityscapes in their styles. They will experiment with color theory and techniques through printmaking, painting, drawing, and collage, led by professional teaching artists. 9:00 am - 3:30 pm, with aftercare from 3:30-5:30pm. Please provide your child’s lunch and drink. The cost of $110 includes the full day of printmaking, painting and drawing instruction, all supplies, a lot of fun, and the children will go home with all their great work. Scholarships are available! To fill out a scholarship application, please click HERE. Enroll today as space is limited. To register your budding artist, or for more information, contact Silvia by phone 206-417-4645 or email, or click the link.